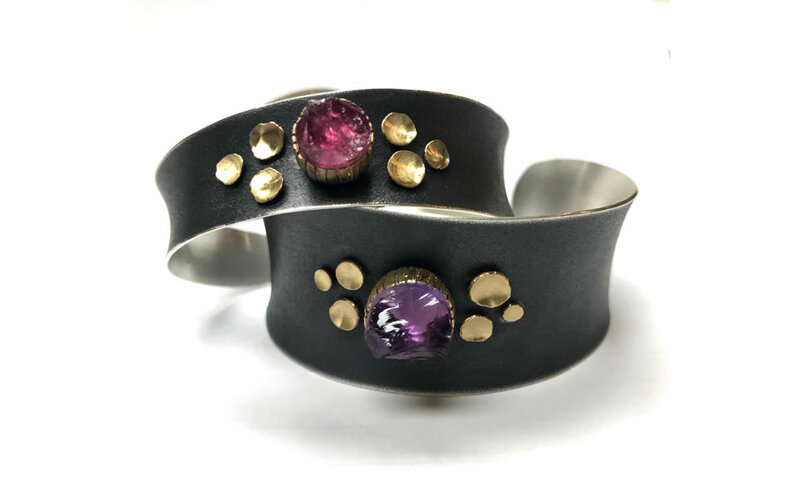 Jewelers and partners Chelsea Stone and Alex Horst were our Featured Artists for the romantic month of February, 2018. 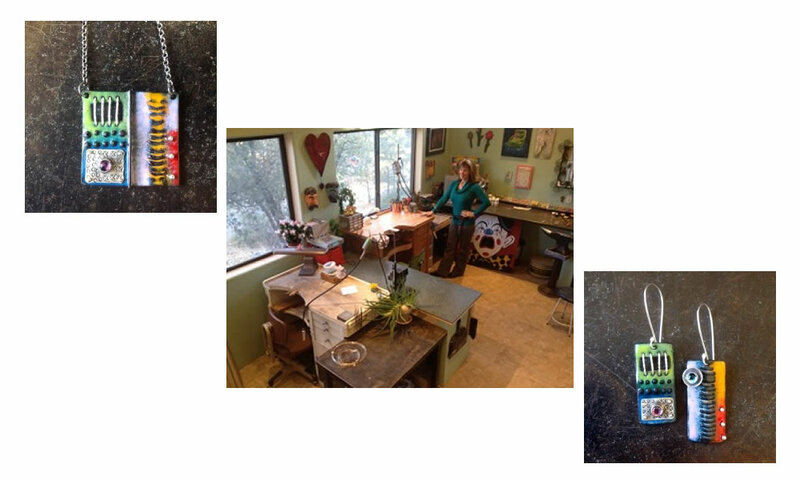 Chelsea has been making jewelry for over 20 years and there is no stopping her! Her creative energy toward her jewelry and life in general, are what make Chelsea and her jewelry so much fun! Her playful style and endless amount of design ideas make Chelsea’s work ever-popular and appealing to all ages. 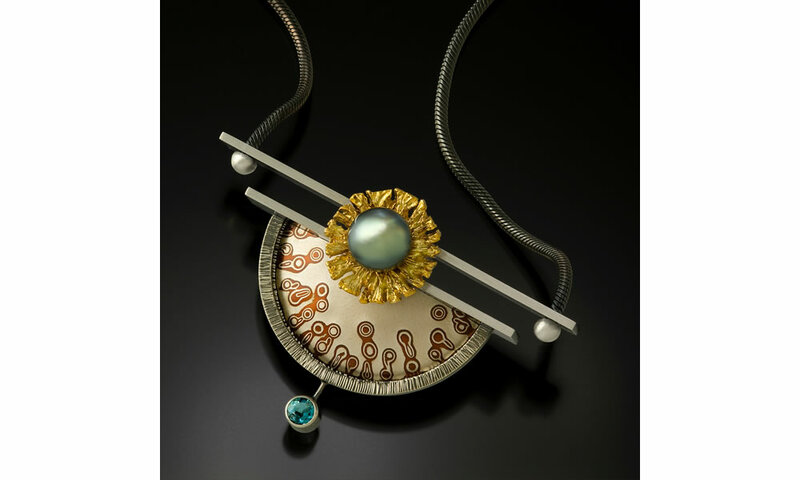 Graduating with a Bachelors in Fine Art – Jewelry from Northern Arizona University and a Masters in Fine Art from Texas Tech University, Chelsea has taught many years in various colleges and universities, but now focuses on her studio work. 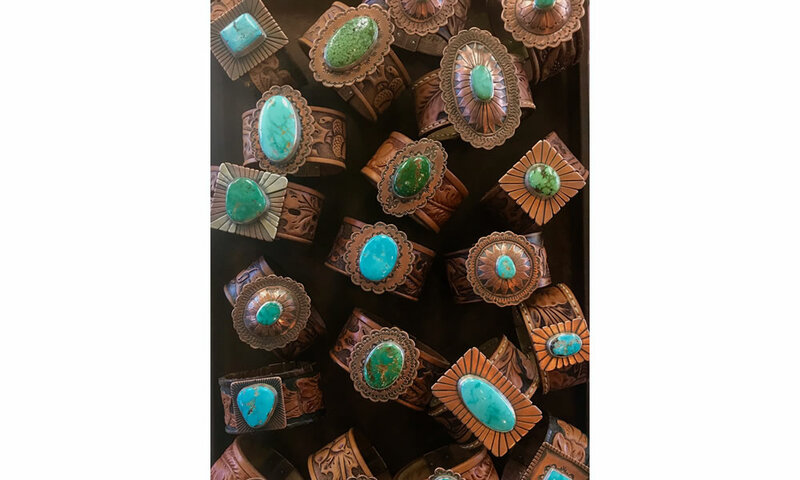 Chelsea has called Prescott her home for many years, although one can hardly keep up with her “gypsy lifestyle” – traveling all over the country exhibiting her jewelry at art festivals. 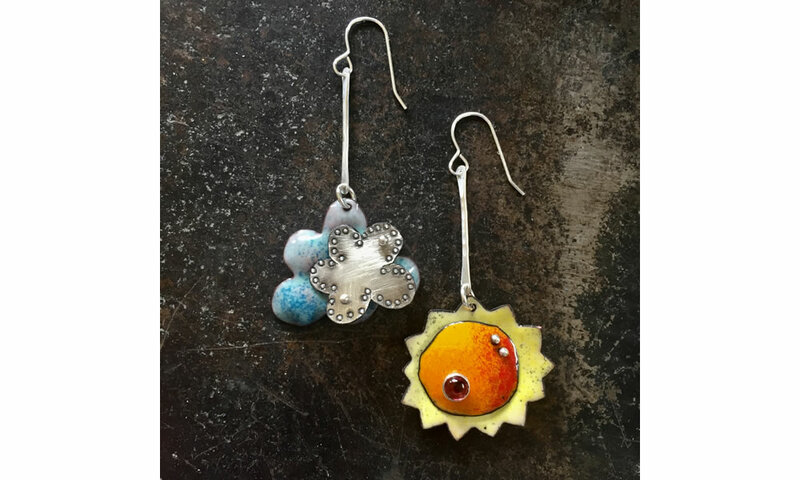 As a self-proclaimed “workaholic” she spends hours creating from her palate of silver, gold, copper, handmade glass beads (she creates herself!) 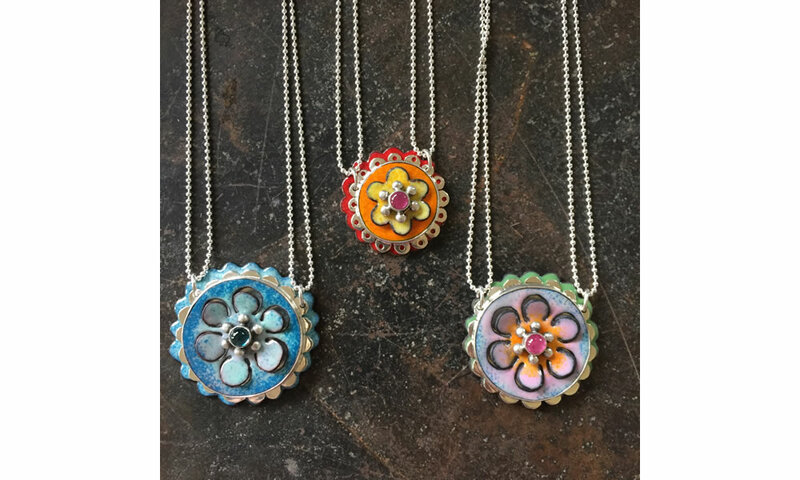 colorful gemstones and brightly colored enamels. In whatever free-time Chelsea has in town, she can be seen having a good time performing with her girlfriends of “Why Not? BELLYDANCE”. 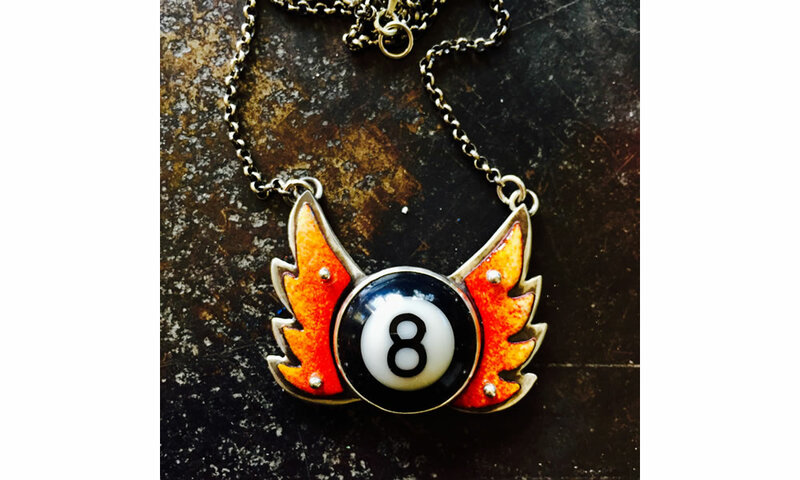 Alex comes by his intense creativity and love for jewelry-making quite naturally. Born to a family who ran a jewelry supply business in Denver, Colorado, at the “tender age of five” Alex was already learning from his father and grandfather how to cut gemstones! Still a young boy, his family moved to Arizona to his grandfather’s horse and cattle ranch in the Prescott area. By the time he was eighteen, Alex’s work was being sold and collected at numerous international and municipal gem shows. His jewelry continues to evolve and grow along with his name as one of the premier lapidary workers in the world! As Alex states, “simple geometry and clean lines are the cornerstone to my gemstone carvings and jewelry creations because they allow the elegance and beauty of nature to speak for itself.” He adds precious metals to his gemstones to create “texture, brilliance and balance”. 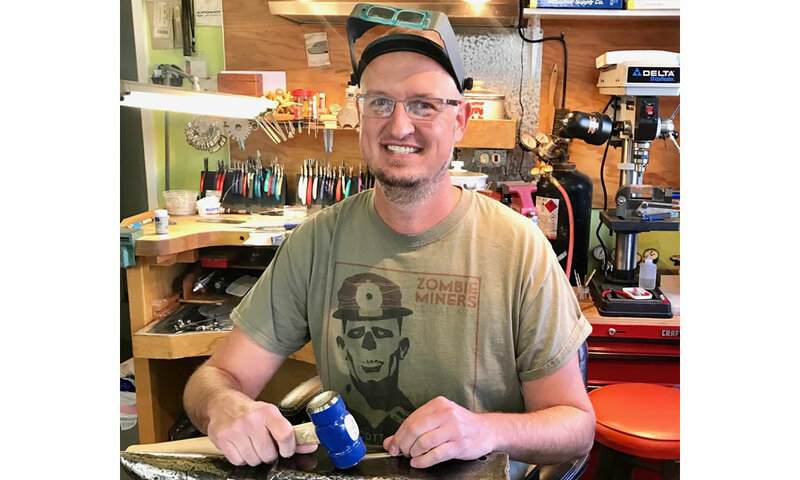 Alex’s passion for creating jewelry is inspired by combinin while balancing the metal properties of gold and silver with the fragility of his gemstones. Alex is well-known for his handmade mokume-gane. 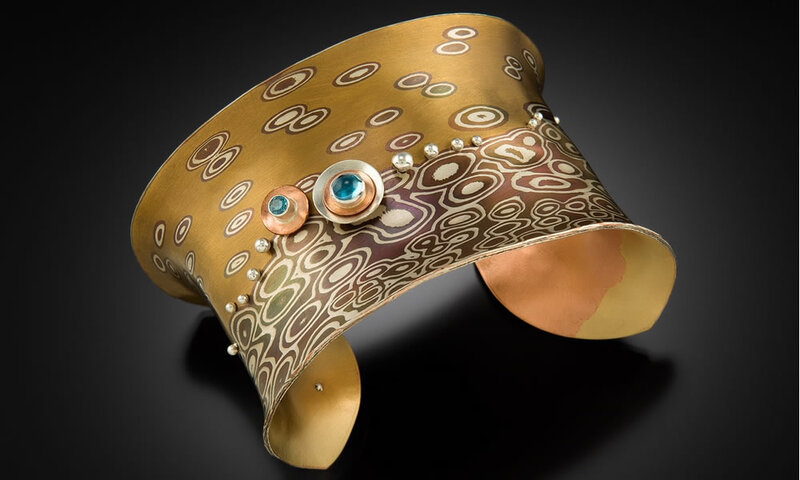 Mokume is from a Japanese tradition, which means “wood-eye” and gane means “metal.” As Alex says “The process to fabricate mokume is time-consuming, tedious, and exact, which scares off most jewelry artists!” The process involves stacking and fusing multiple layers of metal into a billet. The billet is then manipulated in such a way that a pattern resembling wood grain emerges over its surface. 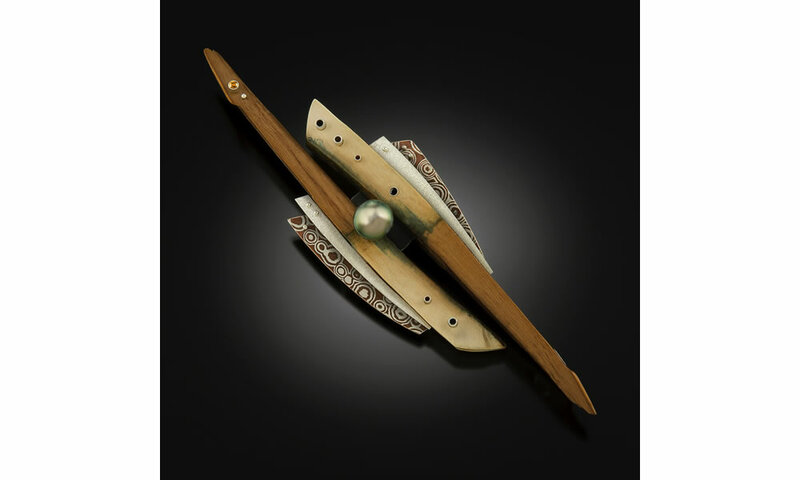 Alex combines this pattern with silver and gemstones, thus creating his one-of-a-kind extraordinary pieces of jewelry. Alex joins Chelsea on many of the juried art festivals around the country, but always enjoys coming home to Prescott.